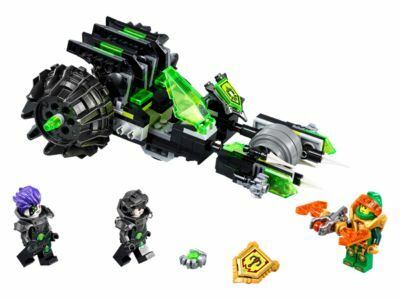 Price is 20% below the initial Lego retail price, a € 4.00 discount! This comes down to 8.37 cent per brick. The Twinfector (72002) Lego set is available from the sites below. However, they do not offer delivery to your selected region. The Twinfector (72002) Lego set is no longer directly available from the sites below. However, 3rd party partners of these sites might still have the set available. Alternate description Double the action with the 2-in-1 Twinfector! Includes 3 minifigures: Aaron, Fred and Pola. Twinfector features 2 minifigure cockpits, 2 critter shooters and a shield holder. Weapons include Aaron’s crossbow and 2 double-sided swords. Divide the Twinfector to launch the 2 fliers! Rotate the fliers' rear wheels to transform them into thrusters, then slide the critter shooters on top for attack mode. Also includes The Crossbow of Merlok shield holder. Place the Merlok Power in the shield holder to upgrade your knight in the battle against the bad guys! Download the free LEGO® NEXO KNIGHTS™: MERLOK 2.0 app to your smartphone or tablet. Ask your parents before going online. Scan shields for the NEXO Power Gamma Rays and Merlok Power The Crossbow of Merlok, then power up in the LEGO® NEXO KNIGHTS™ game! 7 Merlok Powers to collect to stop Monstrox and his army from spreading their digital infection across Knighton. Twinfector measures over and 2” (7cm) high, 7” (20cm) long and 5” (13cm) wide. Each flyer measures over 2” (7cm) high, 7” (20cm) long and 2” (6cm) wide.